I'm a little behind most of the world, but I will watch the royal wedding of the century in about an hour. We tend to live in TiVo time here in our house. We watch the Superbowl a little later, American Idol the next morning, and Good Morning America during the afternoon. With the convenience of TiVo at my finger tips I had no reason to watch the wedding at 1:00 a.m. Please. So after I've showered from my morning walk, prepared myself a pot of tea in my Old Country Roses Royal Albert tea pot, and settled onto my royal red sofa, I'll join the rest of the world (in TiVo time, of course) and do a little royalty watching. I'll "ooh" and "aahh" at the wedding gown worn by Kate, look to see if the prince has stars in his eyes as he catches his first glimpse of his bride, and watch carefully for stoic Queen Elizabeth's reaction to this romantic event. I'll anticipate each moment and yet I'll be a novice when it comes to all the pomp and circumstance. I haven't ever seen much of royalty up close. My familiarity with all things royal is limited to a savvy combination of what I've gleaned from Disney and Masterpiece Theater. Along with millions of others. I understand that people began to camp out on the streets of London a couple of days ago to secure the perch from which they would view the royal pageantry. I will depend on the media to have staked out prime spots along the parade routes in order to view the glitz and glitter. But if I were one of the millions standing out in the Brittish sunshine trying to see the new princess, the prince or the queen, I suppose I'd be jostling for position, craning my neck and hopping up and down in order to see as much royal fiber as I possibly could. Such was the case with Zacchaeus, for a wee little man was he. I read about this well-known short guy just this morning. Jesus was on his way into town and Zacchaeus was just as insistent upon seeing Him as millions of people are about seeing the prince and princess. Zac had some power - he was a tax collector - and he had some money - I repeat, he was a tax collector - but he still had to jockey for position to see the King of kings. And so he climbed up in a sycamore tree...for the Lord he wanted to see! As I read the familiar story about wee Zacchaeus climbing a tree in order to see Jesus, it made me think about the lengths he went to in order to see this itinerant preacher from Galilee. He desperately wanted to see Jesus, wouldn't you say? It wasn't enough to hear that He was in town, to talk to those who had seen Him or to read about Jesus' appearance in the paper the next day. And I don't think Zacchaeus would have settled for a TiVoed telecast of Jesus' stroll through Jericho either. He was willing to embarrass himself in public in order to get a glimpse of Jesus, in person. And here we all sit (or you sat there last night while I slept) to get a glimpse of royalty. Whether we camped out on the sidewalk for three days, we set our alarm clocks for some ungodly hour, or we've TiVoed the event, we're going to great lengths to see the royal couple ride by. And there's nothing wrong with that. Here ye, here ye! I'm not saying there's anything wrong with that at all! My point is not to downgrade our desire to watch the royal wedding. I simply want to ask myself and you this simple question. To what lengths do we go to see Jesus each day? Because we can see Him, you know. He may not be walking through our streets and we may not need to climb a tree to get a glimpse of Him, but we can see Him. We can see Him in His Word. Am I spending enough time there in order to see Him? Am I listening carefully to His words, hanging on to them like the daily bread they are? Am I really observing His behavior there and learning from it? We can see Him in creation. Jesus was directly involved in creation, you know. John 1:3 says, "All things were made through Him, and without Him nothing was made that was made" speaking of Jesus. Am I taking the time to see His handiwork in the world around me? Am I allowing Him to speak to me of His faithfulness through the sunrise, of His might through the mountains that surround me, of His strength through the waves of the sea, of His gentleness through the sweet spring breeze? We can see Him in our lives. If we have a personal relationship with Jesus and we are actively asking Him to participate in our lives, then it's only reasonable to expect that He is doing so. Unfortunately, we often ask Him to work and then we look the other way, neglecting to watch for what He'll do. And when good things do happen, we attribute it to luck, coincidence, happenstance. We forget to acknowledge that Jesus has shown up and done a good thing on our behalf. I think Zacchaeus had the right idea. He was intent on seeing Jesus. And guess what? His persistence paid off. Jesus sensed Zacchaeus' intentions and stopped in His tracks. He told Zacchaeus to come down from that tree and prepare to dine with Him that night. Jesus was coming to Zacchaeus' house! Not only did Zacchaeus want to see Jesus, but Jesus wanted to see him! And He wants to see me today too. 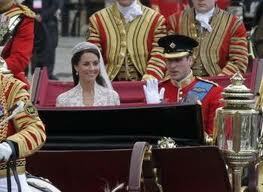 So today I'll watch the royal couple go through the pomp and circumstance of their wedding day. But I'll also be looking for Jesus a little more intently. I'll meet Him in the pages of His Word. I'll talk with Him this morning before I get involved in the situations of the day. I'll seek His counsel and ask for His encouragement. Then I'll watch for Him to work throughout my day. And when I see Him, I'll acknowledge Him. I'll be watching for royalty alright. I'm watching for the King of kings, the Prince of Peace, the lion of Judah. And if I watch for Him, I know I'll see Him. Won't you watch with me?